Trevor was also included on the Bottesford list of Absentee Voters in 1918, which gave his address as Station Road, and his service details as M/2/182650 Pte, 4th Petrol Company, ASC. Trevor Richard Gaylard was born on the 7th March, 1888, a son of Richard Charles Gaylard and Esther Elizabeth Gaylard, nee Starkiss. Richard Gaylard senior was born in 1856 in Potters Bar, his wife Esther Elizabeth in 1856 at Little Berkhampstead. They married in 1878 at Essendon, Hertfordshire. In 1901, aged 13, Trevor lived in Great Northern Railway Station, Hartham Lane, Hertford, with his parents and brother Percy Charles. His father was now the GNR stationmaster at Hertford. Esther Elizabeth Gaylard, his mother, died at Hertford on the 12th August, 1907, aged 53. By the time of the 1911 Census, his widowed father had moved to Bottesford, accompanied by his son, Trevor, and had taken up the post of Stationmaster at Bottesford. Trevor was employed as a ‘general fitter’, but it is not clear if this was with the railway. Father and son lived together at 7 Station Road, Bottesford, where they employed a servant, 26 years old Ada Palmer, born in Balderton, Nottinghamshire. 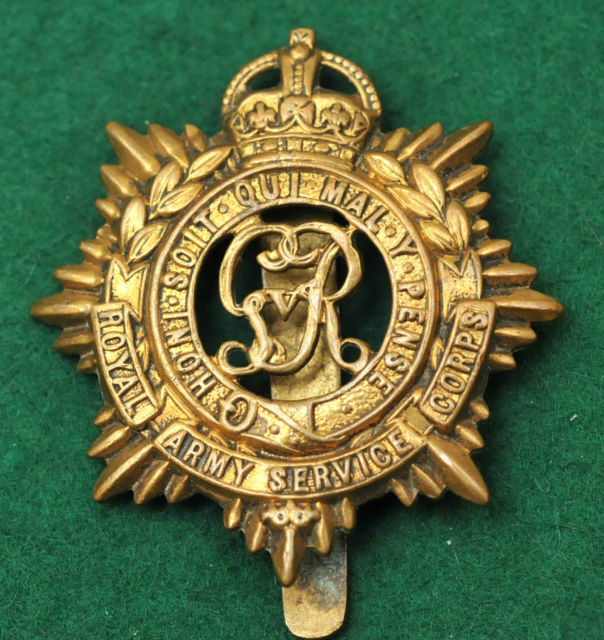 Few details of his service career were located, but it is clear that Trevor Richard Gaylard was Private 2163, Nottinghamshire and Derbyshire Regiment (the Sherwood Foresters) and then M2/182650 in the ASC in which he was promoted from Private to Corporal. 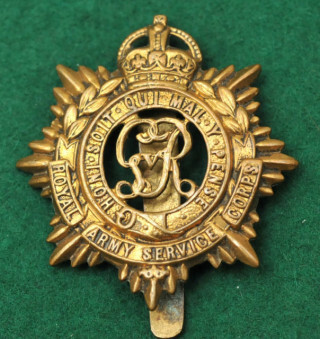 The Army Service Corps (ASC, from 1918 it became the Royal Army Service Corps – RASC) was responsible, along with much else, for the supply of food, water, fuel and domestic materials such as clothing, furniture and stationery and the supply of technical and military equipment. Trevor Gaylard’s unit’s work was evidently the supply of petrol to the army. Trevor Gaylard married Lily Palmer in 1918. She was a daughter of farmer Philip Palmer of Church Farm, Bottesford, and sister of the Ada Palmer who had been recorded in 1911 as the servant of Trevor and his father, Richard Gaylard. 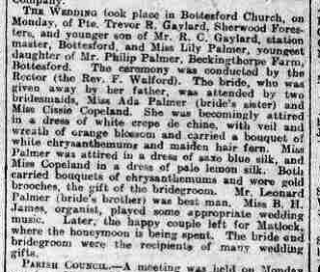 The report by the Grantham Journal indicated that Trevor was still a Private in the ASC at the time of his wedding. The Electoral Roll of 1921 records Richard Charles Gaylard living at the Station House, Bottesford, and Trevor Richard Gaylard living on Station Road, presumably not in the same house as his father’s. It does not indicate that his wife Lily was there at that time, though she probably was. Both took part in productions by the recently formed Bottesford Amateur Operatic Society. Lily had a small part in “Pearl, the Fishermaiden” in 1922, then Trevor was a cowboy in “Phillida, or Love on the Prairie” in 1923. In 1931, Trevor and Lily Gaylard were together at an address on Mansfield Road, Mapperley, in Nottingham. Richard Gaylard retired at the end of March, 1921, and sadly passed away on the 11th September, 1922, aged 66. 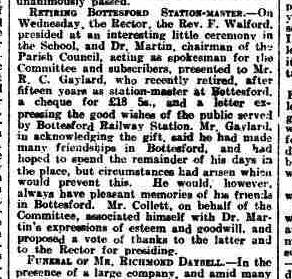 He had been stationmaster at Bottesford for some fourteen years and was held in great esteem by the villagers. Not long after he retired, he was presented with a cheque for £18 5s, and a letter expressing the good wishes of the village, by the Rector, Rev. F. Walford, and the Chairman of the Parish Council, Dr. Martin. Trevor Richard Gaylard died in the Melton area in 1959, when he was 71 years of age.